Centred around the Yarra River, Melbourne has recently been rediscovered and reinvented, and is rapidly becoming one of the most trendy cities in Australia. The second-largest city in the country, Melbourne resides within the Australian state of Victoria (VIC) and is truly diverse, being home to an interesting mixture of historic Victorian architecture and breathtaking modern buildings. Melbourne has a vibrant street café culture and shops to rival any other city in the world, and for many is also widely considered to be the dining capital of Australia, due to its enormous selection of cuisine. 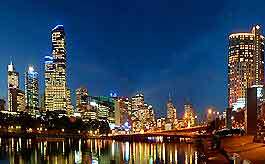 It is only by actually visiting Melbourne that you will be able to soak up the lively, exciting and friendly atmosphere of this multicultural city. The bayside and riverside districts of Melbourne have been transformed over the past decades, following the arrival of appealing new developments, such as the Docklands, the NewQuay and Southgate. 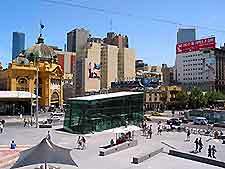 Federation Square is also very much of note and close by, on the corner of Flinders Street and Swanston Street, is the Melbourne Tourist Information Centre, where you can pre-book personal tours of the city. The city centre is understandably one of the most convenient areas to stay, with hotels being close to many theatres, museums and art galleries, as well as the train and bus terminals. Alternatives include accommodation within inner suburbs such as North and South Melbourne, Albert Park, Carlton, Caulfield, Fitzroy, Middle Park, Parkville, Queens Road, Richmond, South Yarra and Williamstown. For waterfront views from your hotel room, the St. Kilda area is a reliable bet. However, do bear in mind that during peak seasons and major events, such as the Formula One Grand Prix, most Melbourne hotels quickly fill to capacity and booking ahead becomes something of a necessity. Melbourne backpackers always favour the city's cheap hostels, which are to be found in good supply around the Flinders Street Station, the Queen Victoria Market and the lively St. Kilda beachfront. Home to many superb tourist attractions, some of the most popular sights in the Melbourne area include the Parliament House of Victoria - standing in the centre and dating back almost 150 years; St. Patrick's Cathedral - with construction taking around 80 years, a breaktaking building finally completed in 1939; the Rialto Towers - the tallest building in Melbourne, with an Observation Deck providing stunning panoramic views; the Melbourne Town Hall - without doubt one of the most splendid landmarks in the city; the Williamstown Docks - a very trendy and appealing area, home to a number of street cafés, restaurants and wine bars; and St. Kilda Pier - one of the best spots around for offshore fishing. Other world-class Melbourne attractions include Arthur's Seat Chairlift - boasting spectacular views over the surrounding countryside, Port Phillip Bay and the beaches; the City Circle Tram - a historic transport system dating back to the 1920s; the Crown Entertainment Complex - a vast complex housing restaurants, bars, a 24-screen cinema complex and one of the world's large casinos; the Melbourne Concert Hall - a major venue for concerts and opera in this city; the Royal Botanic Gardens - superb landscaped gardens founded in the mid-19th century; the Planetarium - recreating the night sky on a huge domed ceiling; the Royal Melbourne Zoo - established almost 150 years ago and particularly popular with children and families; Melbourne Aquarium - with an enormous oceanarium containing more than two million litres of water; the Koala Conservation Centre - in the Phillip Island area, full of friendly koalas and a large colony of penguins; and Luna Park - a historic amusement park. 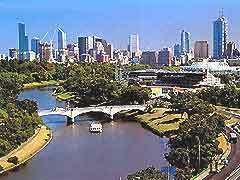 More information about Melbourne Tourist Attractions and Melbourne Landmarks. The city has a large number of excellent museums and these include the Melbourne Museum - built between 1998 to 2000, at a cost exceeding 300 million Australian dollars, this building really is a striking attraction in its own right; the Williamstown Railway Museum - with a fine collection of old steam locomotives, engines and carriages; the Australian Gallery of Sport and Olympic Museum - with information about the exciting history of many of the city's most outstanding sporting events, including the 1956 Melbourne Olympic Games; the Gold Treasury Museum - dating back to the historic days of the famous 'Gold Rush'; the HMAS Castlemaine Maritime Museum - an impressive warship built in the mid-20th century; the Scienceworks Museum - incorporating an enormous array of fascinating scientific instruments and interactive displays; the Australian Centre for Contemporary Art - full of contemporary works of art; and Melbourne's National Gallery of Victoria - housing a number of masterpieces by world-famous artists, including both Picasso and Rembrandt. 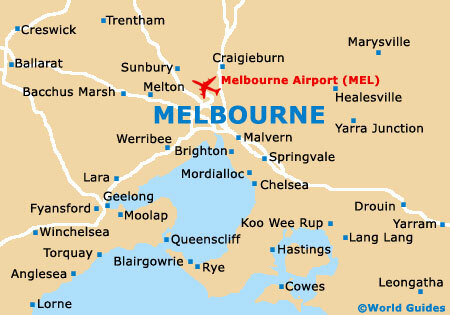 Attractions reasonably nearby Melbourne include the city of Ballarat, the Bellarine Peninsula, Daylesford and Hepbur, Geelong, Mornington Peninsula, Yarra Valley and Phillip Island - with its world-famous colony of friendly penguins, who march every evening from Summerland Beach to their nests, some of which are located in the back gardens of locals. Australia's city of Melbourne is home to some of the world's most stunning, sandy beaches, many of which are relatively close by. Popular with locals, visitors and tourists in Melbourne, the spacious beaches are the perfect place to relax, sunbathe, swim or surf. Combined with sheltered, clear bathing waters, these beaches have always been one of the major tourist attractions in the area and include 13th Beach, Albert Park Beach, Bells Beach, Brighton Beach, Woolamai Beach, Cat Bay, Elwood Beach, Flinders Beach, Green Point, Gunnamatta Surf Beach, Half Moon Bay, Jan Juc Beach, Middle Park Beach, Point Impossible Surf Beach, Port Melbourne, Portsea Back, Rye Back, Sandridge Beach, Smiths Beach and St. Kilda Beach, rightly attracting people from all over the world.